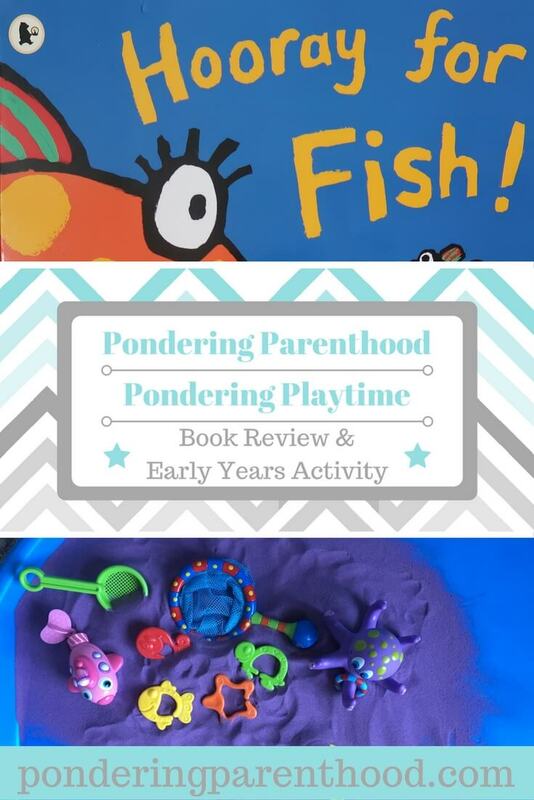 Welcome to Pondering Playtime, my new fortnightly series where I share a favourite picture book and a craft or play activity to go with it. 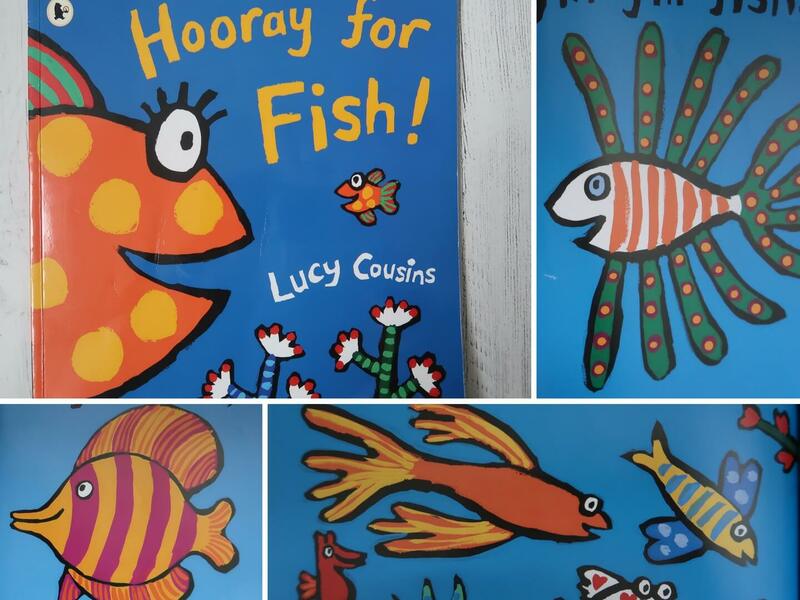 This week, I’ve chosen Hooray for Fish! by Lucy Cousins. I’ve also got a rather exciting giveaway to go with it, too! Hooray for Fish! – What’s the Story? Hooray for Fish! * follows Little Fish as he swims through the sea, encountering his many and varied fishy friends along the way, until he finds his best friend of all. My favourite thing about this book is how beautifully illustrated it is. M loves looking at the pictures and pointing out her favourites. Plus I always get a kiss from her at the end of the story – but you’ll have to read it yourself to find out why! 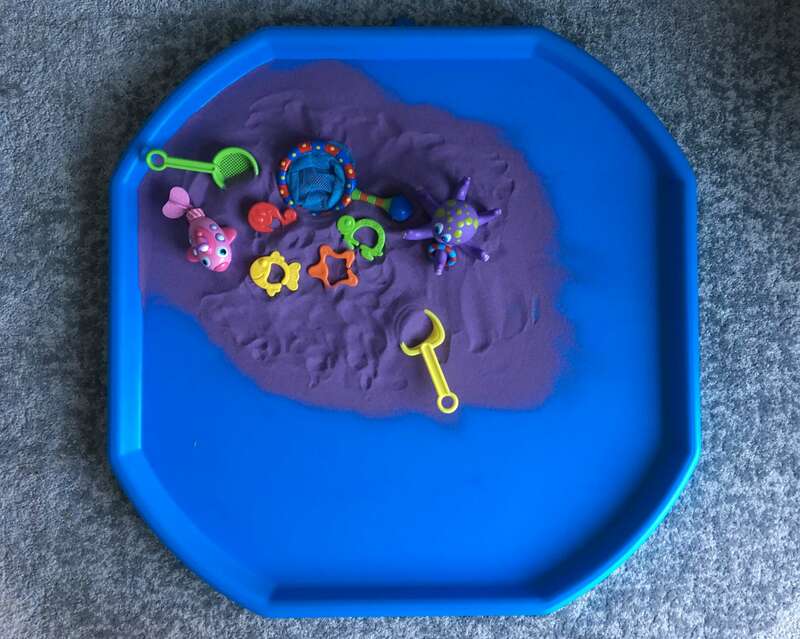 Little M absolutely loves playing with her bath toys, but I wanted to give her a different sensory experience, so I took some of her toys out of the bath, filled her tuff spot with play sand, and gave her a shipwrecked play experience! 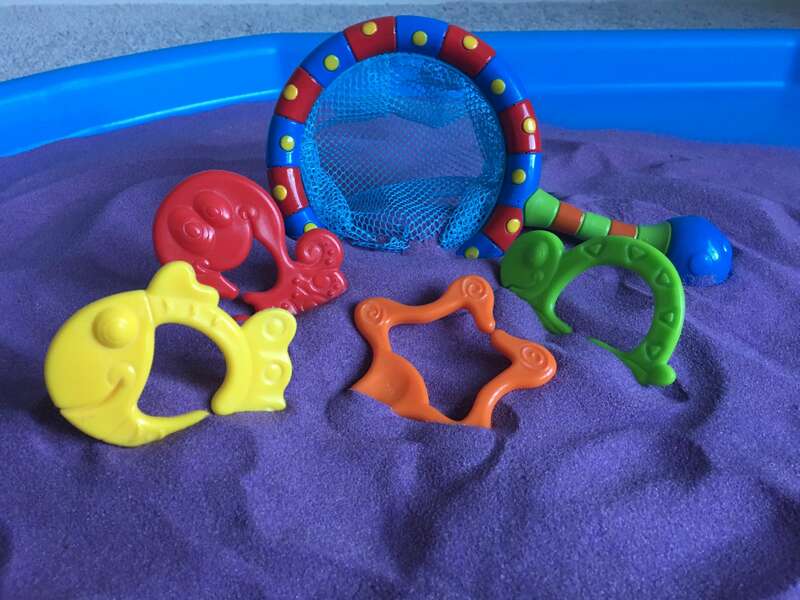 It was really easy to do, with very little preparation, and it meant she could have a bit of time playing in the sand – something she hasn’t been able to do since last summer! M absolutely loves this book! She squeaks away at the pictures and points to the different fish. It has helped her to start to recognise colours, and her understanding of the storyline is evident from the kisses that I receive at the end! Unfortunately, M didn’t enjoy this activity as much as I’d hoped. She’s a very cautious little soul and for some reason, decided that sand was the most terrifying thing in existence when I tried this activity with her! 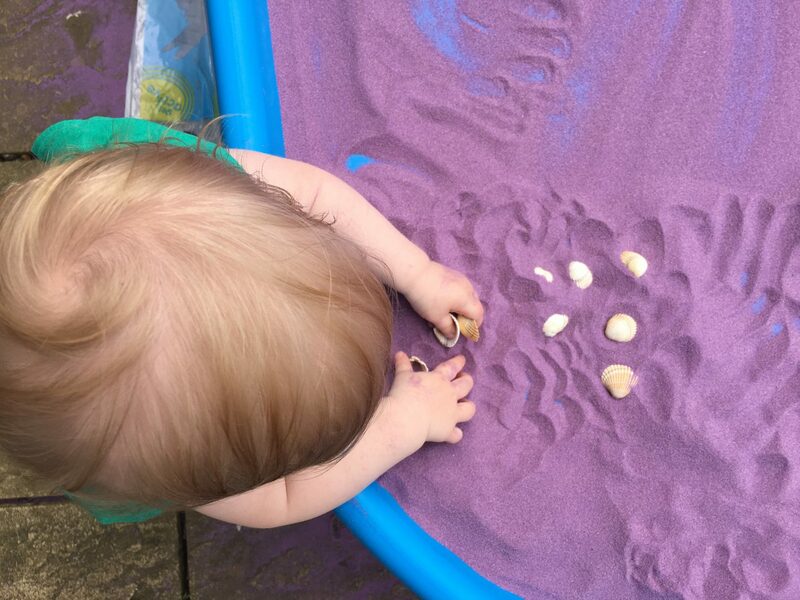 However, at a different time I know she’d love this – she really enjoyed playing at the beach in the summer (after a few visits of her clinging to me and refusing to leave the picnic blanket!) and has even enjoyed playing with this very same purple sand in the tuff spot (see below photo for evidence!). 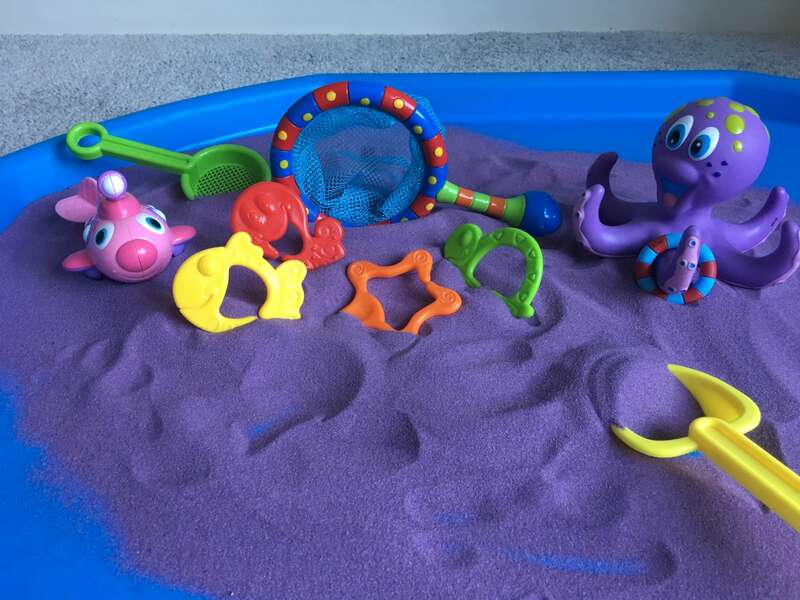 She did enjoy sitting to one side and watching me write her name in the sand and pour it through my fingers, though, so it wasn’t a total loss! And she still adores all of her bath toys – provided they’re in the bath! If you’d like to win a Nuby Splash ‘n’ Catch Bathtime Fishing Set, then simply scroll down and enter via the Rafflecopter! 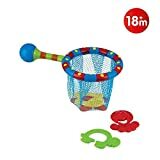 There is one prize of a Nuby Splash ‘n’ Catch Bathtime Fishing Set. No cash alternative. Competition ends 28th January 2018. The winner’s details will be required by Pondering Parenthood who will arrange delivery of the prize. I’m excited to try different things out! So looking forward to seeing how M gets on with the different activities. Hopefully she’ll like the next one a bit more than this one!